Cem called to ask us when we will be visiting him again. Those of you unlucky enough not to know him, Cem happens to be a professional captain and one of the most warm hearted and positive persons I’ve ever met. He also happens to live and work in British Virgin Islands which happens to be one of the top sailing destinations in the world. 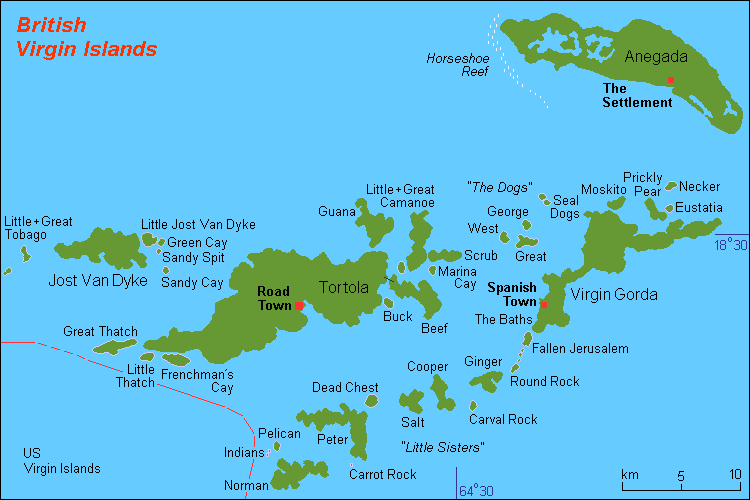 British Virgin Islands, or BVI for short, are around 60 islands scattered around the Caribbean Sea. The area which was a hot bed for pirates between 16th – 18th centuries is now full of tourists, sailors and scuba divers. Oh, and the occasional smuggler. The last time Cem called to ask this question it was a very cold winter day in Istanbul. 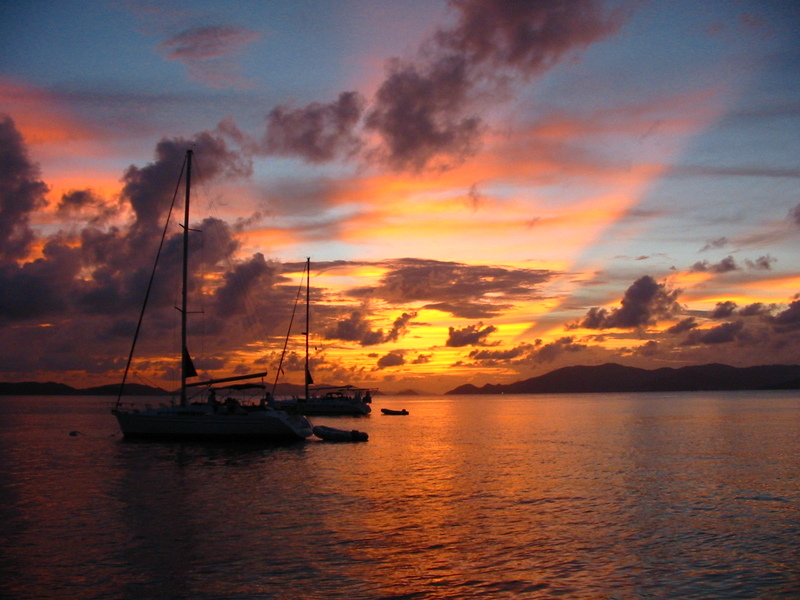 After we hang up, my husband and I looked at each other, said ‘why not ?’, found a charter company, packed our bags and spent two great weeks on a sailing boat at BVI. After a long flight, we finally landed at the Road Town in Tortola, which happens to be the largest island of BVI. The first night Cem mercifully took us to his motorboat harboured in Nanny Cay, a small marina with an incredible view. 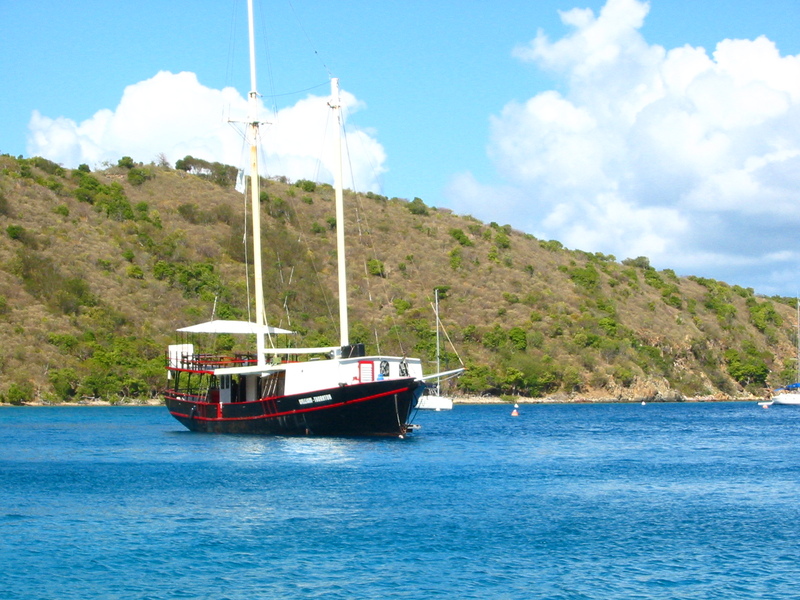 We spent the next day there with Cem and his friends to sample a bit of BVI’s beautiful beaches and night life and we ended up at Willie T’s, a boat that was turned into a floating restaurant & bar quite famous for its ‘jumping’ parties. It’s permanently anchored at The Blight on the Norman Island and serves decent pub food and killer cocktails. 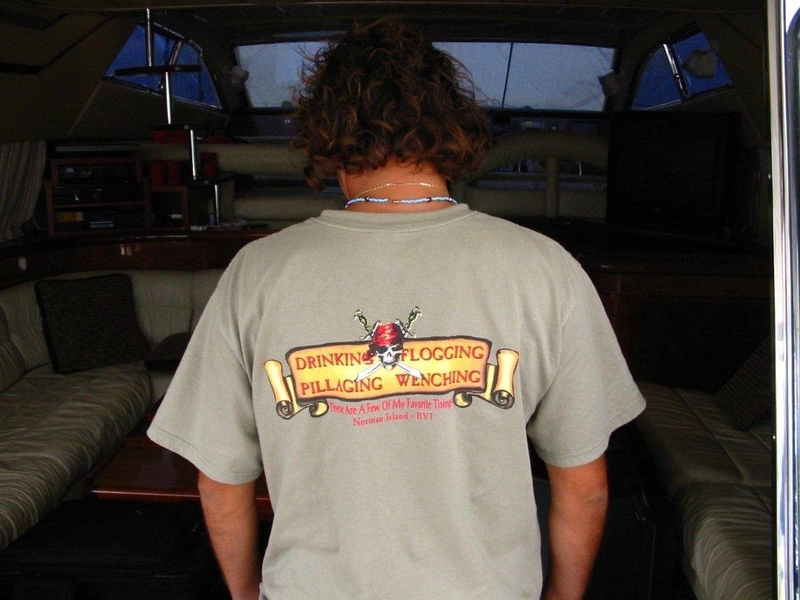 It seemed that it was a long standing tradition at Willie T’s to jump to the sea from the poop deck atop the bar area and if you do it naked you earn a free Willie T’s t-shirt! How incredible, right? Wrong. But sipping a Pain-Killer while listening to the beat and watching the jumping competition was definitely fun. Another not so pleasant aspect of The Blight are the rich Puerto Ricans who came to enjoy an afternoon at Willie T’s with their 1000+hp cigarette boats and cool girlfriends. For those of you land dwellers, this is a lot of horse power and a lot of noise. Although they were keeping the engines running at very low speeds while in the bays, they still sounded like thunder. The next day we got our boat and spent the following two weeks sailing our way around the islands. 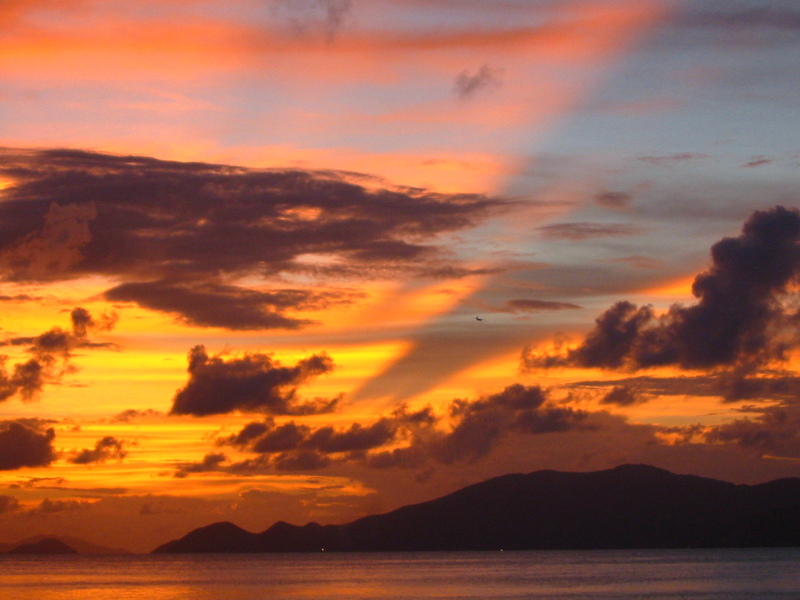 Sailing the Virgin Islands is both easy and very difficult. It’s easy because except for the hurricane season the region is blessed with gentle trade winds that provide the ideal sailing conditions. It’s also very difficult because the whole area is teeming with reefs, some quite shallow. Night sailing is a no-no and mooring can be a challenge if you haven’t reserved first. The Virgins are everybody’s idea of how Caribbean should look like, it’s almost unreal. / Beaches of white sand and palm trees? Check. / Small islands popping out of an azure sea? Check. / Sunshine, cloudless skies and ridiculously colourful sunsets? Check. / Friendly locals serving lobster and pina coladas? Check. / Privately owned islands with villas and super yachts for the uber rich? Check. / Pirates? Well, if you’re ok with Captain Blackbeard instead of Johnny Depp, Check. The history of the Caribbean is filled with shipwrecks and pirates. 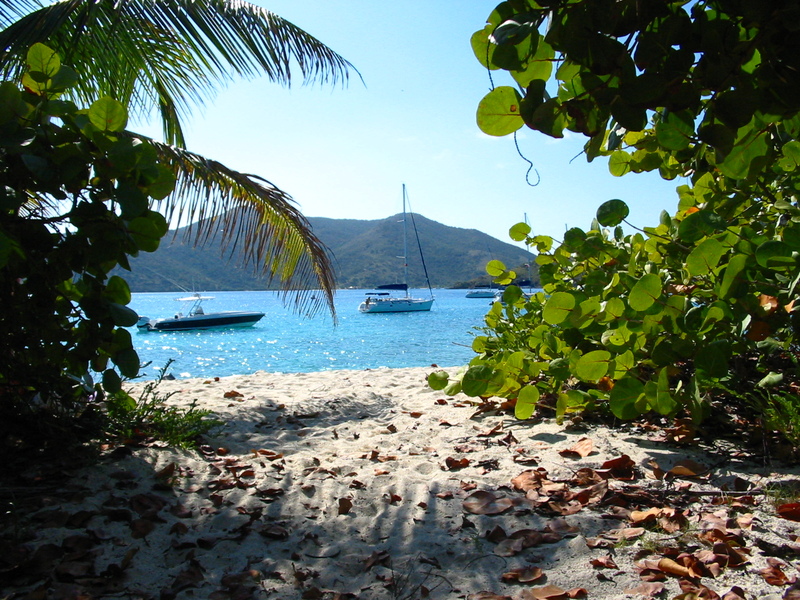 And nowhere is this truer than the BVI with their hidden coves and passages. Situated right on the treasure route from South America to Europe, the area was the playground for many notorious Caribbean Pirates such as Black Sam Bellamy, a fashion forward pirate who was known for his good looks and silk clothes, Calico Jack and his lady pirate lover Anne Bonny, Bartholomew Roberts who became one of the greatest pirates of all for ‘the love of novelty and change, not for plunder’ and the most famous of them all, Captain Blackbeard who would go into a fight with slow burning matches in his beard and hair to make himself look more devilish. In 16th century, Spain was the most powerful nation in the world and it was controlling the wealth of the Americas and West Indies. Other countries were afraid to challenge the mighty Spanish Armada directly but they were happy to see pirates siphoning the treasure ships full of Aztec gold intended for Madrid, as long as they can get their cut. So, the English, French and Dutch start handling ‘letters of marque’ to the pirates offering pardons in exchange for a healthy percentage of the plunder. This is how the government sponsored pirating, in other words privateering (bucchaneering for French) was born. 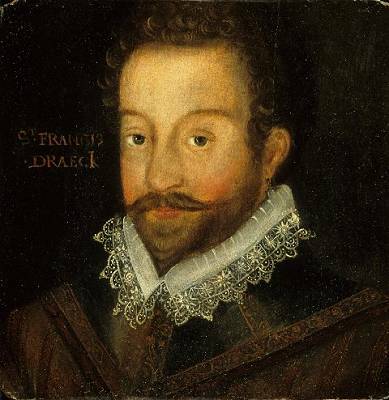 The most famous privateer of them all was Sir Francis Drake (or El Draque to his Spanish enemies), a pirate turned privateer who was so successful in bringing the Spanish gold to England, he was decorated with a special medal by Queen Elisabeth I and later defeated the Spanish Armada as an Admiral of the British Empire. Today his name is given to the main sea channel connecting the Atlantic Ocean with the Caribbean Sea. He was also a bit of a poet.I came across the below among his notes, and it’s good enough to re-quote. A pirate and a poet, no wonder why the Virgin Queen was swept off her feet! Disturb us Lord, to dare more boldly, to venture on wider seas, where storms will show your mastery, where losing sight of land, we shall find the stars. We ask you to push back the horizon of our hopes, and to push us into the future in strength, courage, hope and love. When I was a kid, one of my favourite books was Treasure Island by Robert Lewis Stevenson. 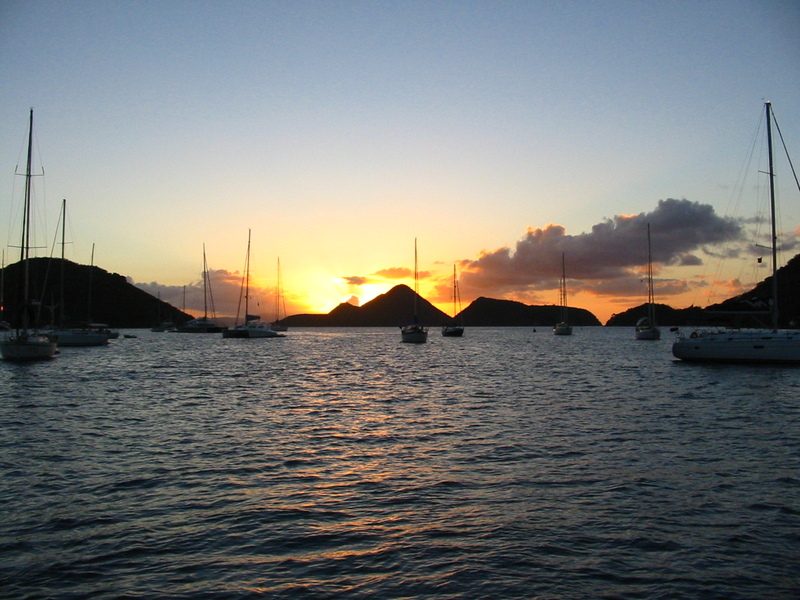 When I found out that he got his inspiration from the Norman Island and many of the other places in the novel are scattered around the Virgin Islands, I returned to my childhood. We snorkelled at the Caves , sang ‘15 men on a Dead Men’s Chest’ at the top of our voices while sailing around the island where Blackbeard left 15 of his men with a single bottle of rum to die and spent a night at Soper’s Hole, the favourite anchorage of the great pirate and his legendary ship Queen Anne’s Revenge. Soggy Dollar Bar on Jost van Dyke island, although crowded could always be trusted for an afternoon of fun. The beachside bar got its name from the wet (soggy) dollar bills that its customers were using to pay the bills, for the bar could either be reached by dinghy or by swimming. It’s popular for being the inventor of the Pain Killer, a BVI speciality made of black rum, pineapple and orange juices, nutmeg and lots of ice. They prepare it in huge gallons and serve in big glasses. It’s about 5000 calories, very delicious and a couple of them are enough to put you in an extremely great mood. We spent a day swimming, playing ring & hook with complete strangers – a huge challenge after one or two pain killers- and relaxing in one of the seaside hammocks. 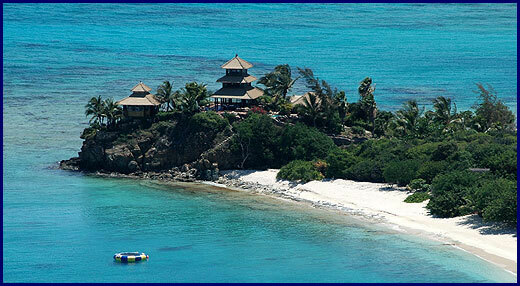 Another island we liked is the Virgin Gorda, meaning the ‘Fat Virgin’. Christophe Colombus named the island as such, because the island’s profile on the horizon resembles of a fat woman lying on her side. We spent couple of days around the island’s beautiful bays and at nights we sampled the restaurants and jazz bars in Spanish Town. Our favourite was the Rock Cafe, a restaurant serving fresh fish and lobsters a la Caribbean. The food was great but the real surprise of the night was at the bar, where a jazz pianist was playing whatever came to our minds in exchange for an occasional glass of Jack Daniels. Lot’s of songs, lot’s of Jacks, great memories. 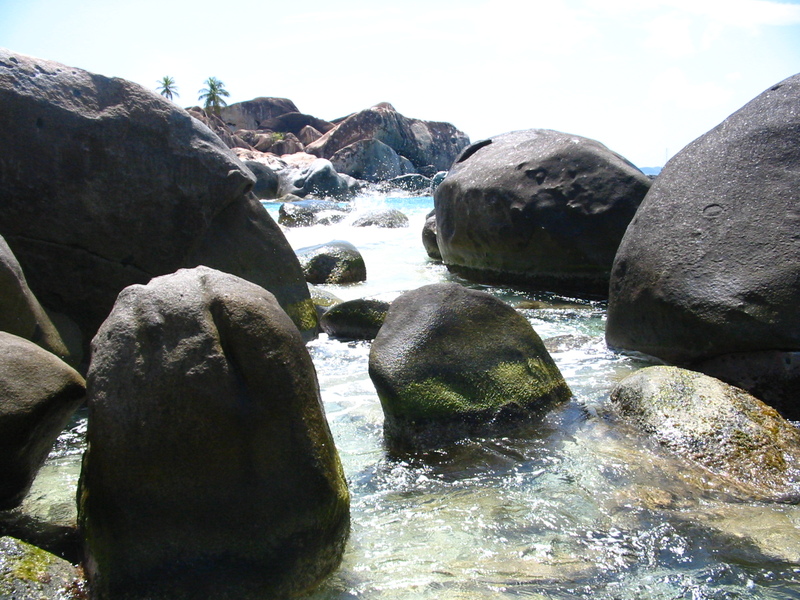 In Virgin Gorda, there’s an area of natural pools and grottos formed by giant boulders called the Baths. It’s like a natural fun park. There’s a nice route formed by the boulders which starts at the Dinghy Beach, named such because it can only be reached by dinghies, goes through many small pools and over rocks and ends at another -slightly less crowded- beach called Devil’s Bay. Another unforgettable place was the North Sound, a marine playground surrounded by islands and shallow reefs. Reaching it was quite tricky for the passage was both shallow and narrow, but definitely worth the effort. We spent the day swimming, snorkelling and visiting the surrounding islands on our dinghy. At night we had a lovely dinner at a restaurant on a tiny island called Saba Rock, ended up making friends with our fellow diners. I don’t remember the food, but the conversations were warm and fulfilling. If one day I win the lottery, North Sound is the place I’ll go to buy myself an island. 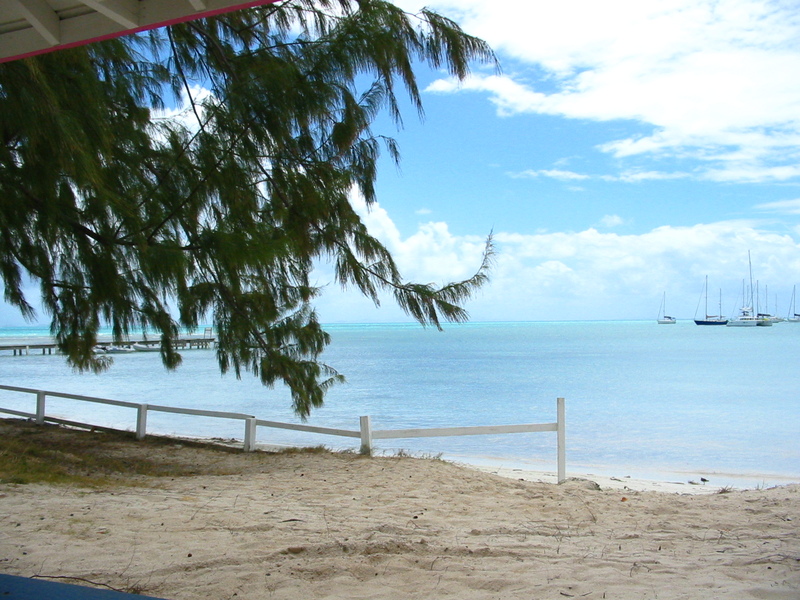 Our absolute favourite is Anegada, an island surrounded by shallow coral reefs all around. Getting there by a boat is tricky, because the island is very small and extremely flat – its highest point is about 8 meters above the sea level – and the only opening to the safest anchorage is narrow and if the weather is cloudy or the seas are high, difficult to see. Naturally, we chose the only cloudy day to sail to Anegada. But once we arrived, we were in heaven. 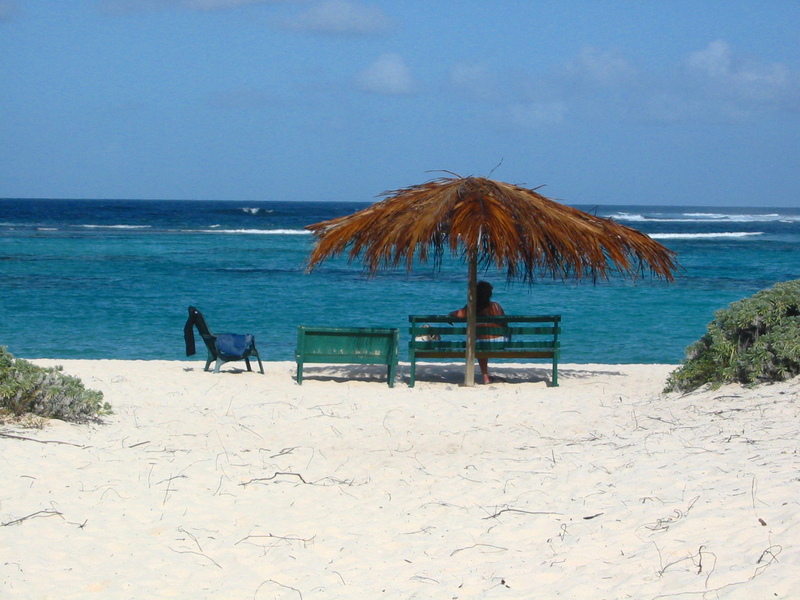 Anegada is actually a flat atoll guarded by the Horseshoe Reef, one of the largest reefs in the world. 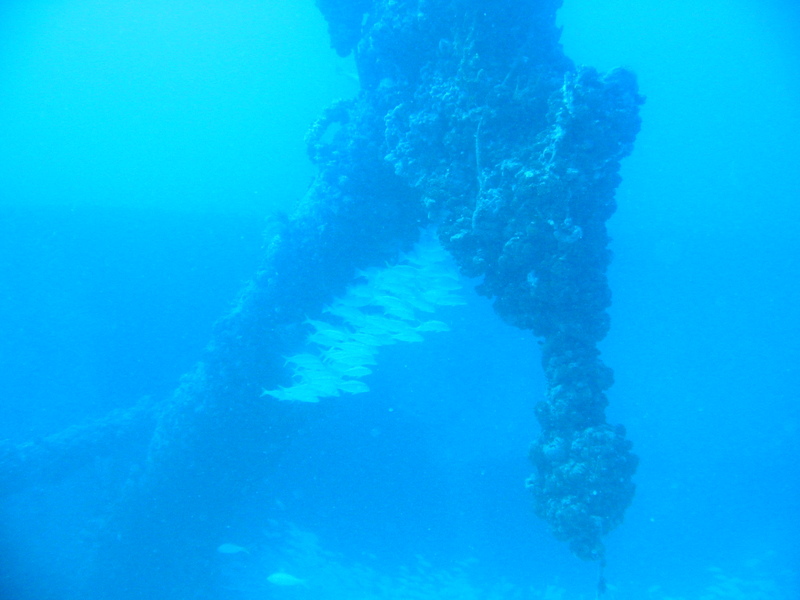 The reef is also famous for its shipwrecks, there are hundreds of them spread around making it a must-go place for divers. Other things the island is famous for are its lobsters and its white sand beaches, so it’s no wonder we divided our time between the three. After a full day of wreck diving and swimming at the Loblolly Bay, we had a wonderful dinner at a restaurant on the beach. The restaurant was not crowded, because they were only taking reservations according to the number of fish or lobster that they caught during the day, and they were cooking it all on open fires, which were the main light source apart from the stars. We were sitting at a table barefoot on the beach, eating to superb seafood and listening to a guitar that somebody was playing under the stars. It was simply breathtaking. Soon afterwards we had to come back to the real world, but Cem is still there, working as a captain and a relief worker for the survivors of the earthquake in Haiti. And occasionally calling us to remind us the magic of Caribbean. Well, maybe next time.